Derby is quite a central place and relatively easy to get to, so we do enjoy travelling down and seeing what is happening. For those who have not managed to get there yet, it is a friendly festival wit venues that aren’t too far from each other, and always a good and varied lineup across the range of Folk genres and popularity. We think in all ways it gets the balance good for an inner-city festival). There is also ceilidh, often some dance workshop and plenty of public displays too that make it a fun few days. 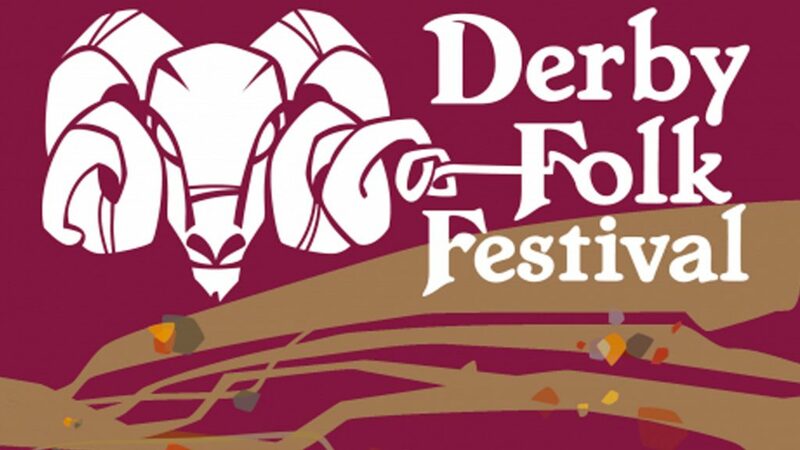 Thinking about Derby Folk Festival, the first rather small (but important) point to note is the Main Marquee. Every year its a sight to see. It’s a big space sitting in the very heart of Derby’s art quarter which ends up weathering an potential weather storms at the quite late time of year. In 2016, the rain fell and got everywhere. Let us say the Marquee seemed to take a bit of a battering and the Gods seemed displeased. This year the Marquee is reinforced, looks a lot more solid like a great metal tree awaiting the harshest of elements. Unfortunately (or fortunately) the weather didn’t come so it wasn’t put to the test. It still looked great though. Another thing about the festival is there is plenty to see, some cool food vans, many great bands and the lovely yearly addition of Adverse Camber (more on them later). Apologies if you or your band are not mentioned below, we have taken a chance to highlight some of the lesser-known artists this year. The rest of you, I will catch up with you shortly I am sure! So.. lets get to the music! 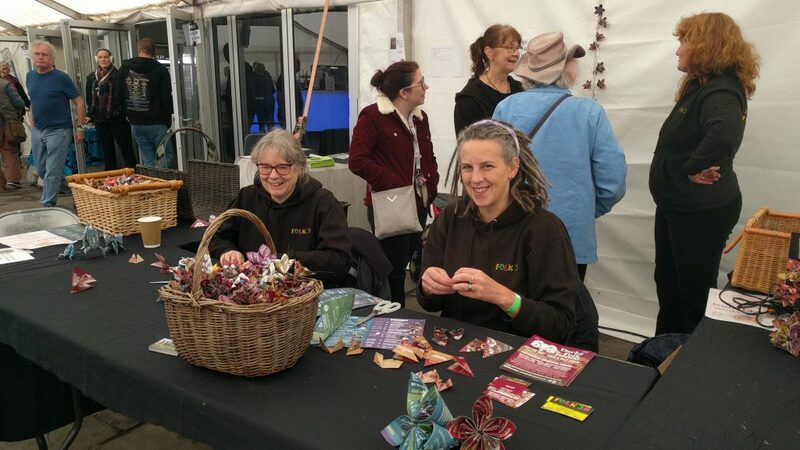 Rather than go day-by-day, let me point out some of the great stuff that springs to mind that I would recommend and makes the festival special. A young folk bicep of a group flexing their musical muscles, “Rusty Shackle” is an energetic start to the festival. From Wales, the groups comes across as a sometimes understated indie voice, sometimes a fine mirror to Billie Joe Armstrong; either way they have an incredibly broad range. One minute it is the broad anthem of “King Creole”, a song of self worry and ruin, the next it is a surprising medley of numbers including the wonder of “Touch My Bum” (The Cheeky Girls) which got a few nods of recognition. They certainly have a sense of humour too, and it is this fresh-faced, joy and fun that make them a very good gateway to folk for a young crowd; they are a veritable folk aperitif. Other fast and melodic numbers include the quite sweet number “3AM” with a welcome bit of banjo riffing, the denser more urban and expansive “When the Morning Comes”, and a personal favourite “Down to the Valley” that reminds of the best of 80s pop in a direct collision with Show of Hands at the top of their game. It is all a sweet sound indeed with electric guitar, fiddle, banjo and drums and trumpet laying down spritley, rocking and seriously entertaining set of tunes you should check out. They are also a pretty industrious bunch being on an extensive tour so see their website and perhaps check them out here. 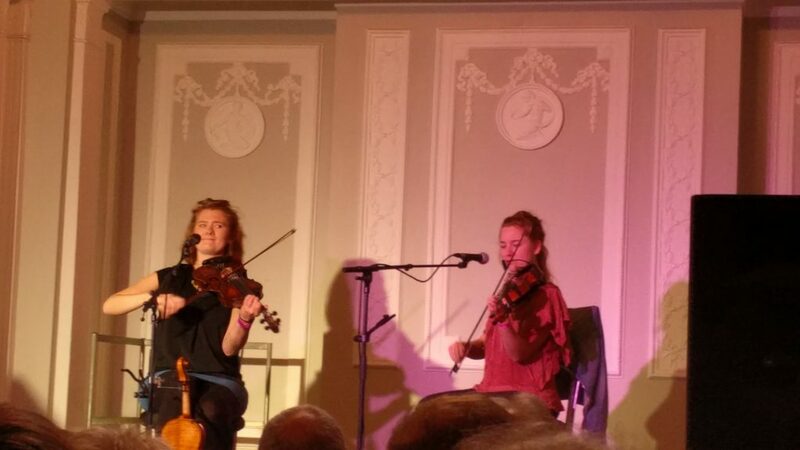 Fantastic as always with excellent fiddle technicality and songs of evocative soundscapes, we caught them as they were trialling some new material much of which revolved around French bal music and other influences from the region. They did “Cuckoo” from their “Already Home” album as well and this was rich and deep as ever. This allows us to lose ourselves in the ballroom amongst the party of strings. One of their new numbers took us into the depths of forests, in a sweeping and glorious portrayal of environmental destruction, and this was our favourite. Epic and contained like a jack-in-the-box, the Rheingans continue to impress and make a mark. We are just a little dismayed we did not catch their full set (our fault, nowhere elses). Details of their projects can be found here. Burning brightly from a number of past intriguing shows, Adverse Camber return to Derby Folk Festival with performance, story and song about the old book of tales written in Middle Welsh, the Mabinogi. We have seen them on more than one occasion and the fire is still there in their performances. It is quite a treat to see something drawing on old history and myths from our own isles, and I am saying this absolutely loving the older shows from Persia (the Shahnameh show the other year) and their more Nordic sagas. It is a warming experience for Derby to let the Storytelling in, after all stories and myth aren’t everyone’s cup of tea. Whichever side one falls on, here it certainly adds to the variety of what is on show and delivers a quieter (but not too much! ), individual first night at the festival. It is quite a sensory, word-spinning reflection of a show and as such it brings a different kind of wonder to the corner of the Guildhall for a night. Telling some stories of the fair and just lord of Gwnedd, Math fab Mathonwy, Pryderi the lord of Dyfed, a magician (Gwydion), heroes (Lleu Llaw Gyffes) and a woman made of flowers (Blodeuwedd) there are lots of enchanting tales, and as with many stories from history; usually a moral involved (especially with Blodeuwedd). The wonders keep coming.Whether it is (literally) magic mushrooms transforming into golden shields, a plot involving the theft of especially tasty pigs or (my personal favourite) the part where the great lord transforms his son into a series of animals (and learns the creatures’ natures) there is a lot to digest, and like a fine stew more the better for it. The three storytellers Stacey Blythe, Lynne Denman, and Michael Harvey all have their time to shine as musicians and singers in turn with Michael Harvey taking the lead with recounting the stories. The music is stirring and the stage evolves alongside the story which is a pretty special thing to see. What happens is that throughout the show the cast carry and assemble of series of sticks in what at first seems like a kind of sculpture maze, but it becomes apparent that it is forming the aspects of the stories so the sticks are representing either creatures, mountains or even dead soldiers. The movement of the sticks actually grounds the play and connects the artists to the environment, the touch of dynamism is welcome and it is intriguing to see how the sticks assemble together and actually balance. It is a pleasure to see the company’s continued creative use of set pieces in their shows. Alongside Naomi Wilds (producer) they have put together a close to home, wondrous series of stories that will leave you wanting more of the magic and more of the myth from those rainy, misty Welsh valleys. We heartily recommend, as of the time of writing there are two more dates coming early 2018 for the show if you can make them, have a look here. Robyn Johnson joins a (growing) list of female acoustic musicians this year who are convincing me that you do not necessarily need a full band to create a good variety of songs and feelings. Admittedly and embarrassingly at time we at FP find solo guitar acoustic artists a little wanting and numbing. Of course there are always exceptions, and this is not knocking guitars of any shape or size, we just require more convincing. Let us say however that this year we have come to out senses a little bit more on this issue. Under the banner of Village Folk (excellent hosts in and and out of the Derby Folk Festival, see here), Robyn emerges riding a midnight blues train that has a few folk-town stops along the way. Johnson played some delightfully understated and rhythmic entries such as “Say it with wine”, a lyrically break-dancing tune that wears a bit of a Country and Western hat. Sweet and vulnerable it probes modern living and anxieties in what is an essential piece of acoustic listening. There is also the exploratory, evocative “midnight ramble” which Johnson plays to warmed up, appreciative and rapt audience. Midnight Ramble has particular interest due to it being written about the characterful characters and experiences gathered while the inner town of Derby late on a Friday night, it has everything “Gypsies selling roses”, propositioning men, and a swirling blues ambience. “Plastic Bag Fairy” is a demonstration of Johnson’s excellent acoustic guitar times and tones; as the first song she wrote it is interesting to see how it contrasts with the rest of her set. Slightly more optimistic and sunny, it shows the good in people who have little to live on. Ending on “Pour Me” is the striking of a match to a can of gasoline as a finisher that refuses to take things slowly. An intriguing addition to Derby Folk. Worthy and in a way delightfully low-key, her songwriting left an impression with us. Check out her Mixcloud of recordings here. Pretty much the highlight for us and several others at the festival, Kim Lowings and the Greenwood Band had been on our cards for a good while, but we hadn’t seen them live until now. The band has a good sound and a nice range of instruments. Lowings herself has a distinctive and clear voice and it was all enhanced by the Guildhall’s acoustics. The joyful thing about Lowings and the Greenwood is that they have a playful aura which they cast on to several oldies giving them continued leases of life. Their version of “The Cuckoo” was rather special, and their take on “Oh the Wind and Rain” leaves you wanting more. We do not want to go into too much detail here, except to say they are an entertaining and rich sound experience, and that for you should check out our other blogpost here about their latest album “Wild & Wicked Youth” here. Take a look at Kim Lowings and the Greenwood’s site here. Kirsty Merryn was a very welcome addition. Recently basking in the sunshine from her debut album “She & I” (it is very, very good) she had a chance to perform in Derby Cathedral to an attentive audience. 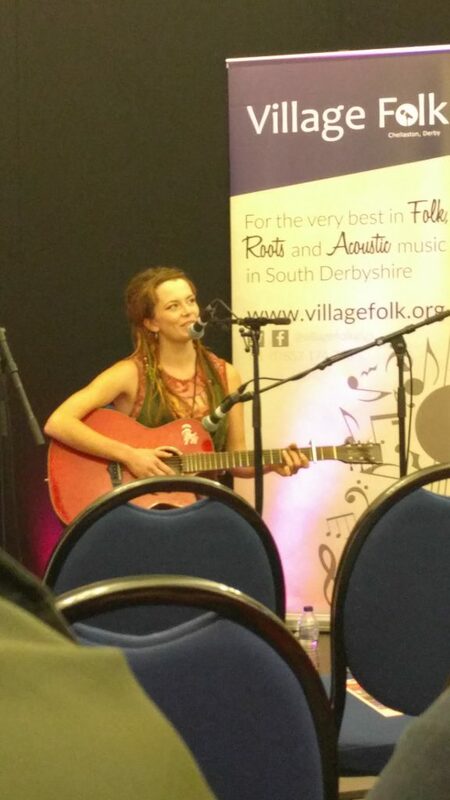 Performing her numbers solo without band accompaniment, Merryn brought a touch of class. At one point she was brought a bouquet of flowers (this has happened a lot while we have been on the road recently), adding even more colour to her flourishing, piano led set. Some songs she shared included ghostly tale “Without Grace” about Grace and William Darling and a tall lighthouse, “The Birds of May” had a strong stillness to it’s sound, like a pagoda next to a small pond of bright koi. This was a general theme and feeling throughout the set; Merryn provokes with a powerful front and a quiet strength that shatters aggravating noises around. She is a fantastic role model in this regard that men and women could look to equally. She also previewed a love song to the sea that she was working on which was exciting to hear. Usually she is the support for Show of Hands, and in a way she is a perfect foil to their louder more anthem-fuelled sounds. They both share a sense of wonder in people and musically approach their reflections on them from different angles. Like Kim Edgar but earlier in furrowing her own path, Kirsty Merryn is on an upward trajectory. Check out the video below, her website here and keep tuning in for more writing about her in the near future. Oka Vanga are another group for which we have been acquainted with for a while. We reviewed their latest album, “Dance of the Copper Trail” and found it, “An incredibly listenable album that is tightly managed and has a pretty rich, consistent sound” here, Suffice to say they did not disappoint in person either. Playing some material from their EP, as well as some other acoustic wonders (bolstered by some great double bass) like “The Devil’s Tide,” an exciting, interesting song about a female pirate. Hosted by live music aficionados, “Village Folk.” they brought a Western charm with their tales of birds, trains and magical trees. The set was punctuated by a heartfelt and warm few songs by Dave Sudbury. He sang “The King of Rome”, and we cried a lot. Fantastic to see him and the friendly reception that he got with the generous applause and acknowledgement. Here is Oka Vanga’s website. There were many big names at Derby too including Show of Hands, Oysterband, Roberts & Lakeman, and Leveret too which were fabulous to hear while we were moving from place to place. The schedule is enormous, detailed and leaves you with choices to make but in the best possible way. This coming year the festival will be running from 4-7 October 2018. There will be an extra concert on the Thursday compared to previous years (see the site for details).